Organizing club: FMBB 2019, z.s. 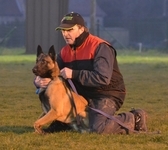 Obedience team is composed with maximum 8 effective participants and 2 reserve participants. Payment for the registered effective participants is mandatory. Read regulations for the compositions concerning the different classes.